Had Alex (MVP - from NJFishing), his nephew Chrisitan, Bob, Anthony, and Jerry on board today. Started out togging the reef very slow, ran south and set up made 2 moves and had a steady bite all day. Landed 25 keepers up to 9lbs, and over 60 shorts, Christian (Grasshopper - from NJFishing) landed the pool winning 9lb'r. In between spots saw the gannets hitting the surface and we landed 6 short stripers to 27 inches. Great warm weather today. Yesterday I had a two man charter for blackfish. Both guys never blackfished before so I headed south to where the fish have been chewin pretty much nonstop but the keeper ratio on some days are better than others. First drop in 55 feet produced a lot of shorts with a handful of keepers so I headed out to a wreck in 70 feet but we had no tide or wind so I couldn't get set up right on it. From there I headed to the reef and we had a little bite going but it died in 30minutes. Went inside to a wreck in 40 foot and we had a steady 2 hour bite with short tog and keepers up to 5 pounds. My guys limited out plus took home and extra ten fish from me and the mate for a total of 22 keepers plus we landed over 60 shorts so we had alot of action. The guys got the hang of it after the first drop and by the end of the day John and his friend Mike were swingin doubles. Nice!!! Saturday I had an open boat trip with a bunch of my friends and two new guys from north jersey, Paul and Artie. We set up on the rocks nice and early and got a pick going pretty quick but it didn't last long. We then went further inshore to another ledge with the same results. From there we hit 2 more drops further north with just minimum results. After that I started south about 12 miles and hit a spot in 65 foot. Few bites and we headed farther south some more to a wreck 6 miles north of Barney Light. Drop and reel fishing for 2 hours with some nice tog. We winded up with 30 keepers up to 6 pounds plus alot of shorts. Nice day overall. Today I had regular customer Mr Monty and friends for some togging. We left the dock an hour late due to one of their guys waking up late which they eventually told him to turn around and go home I ran north and caught the last hour or so of the bite there. I made another drop 2 miles farther north in 45 foot and picked a few there but they were barely chewin. From there I ran south 12 miles to a wreck in 65 foot and we finished the day there with a decent pick of nice size tog with the biggest fish around 6 pounds. Nothing real big for us today but some real nice quality fish. Tight lines. Had Bucky with buddies Corky, Joe, Rich and Tony P, with son Will. Went south and had a southerly swell with dirty water, every spot we had showed tons of life that was landing well over 100 Blackfish today. However shorts were the rule of the day, landing 20 keepers to 5lbs. Most of the Tog keepers came later in the day once the west wind knocked down the swell and the water cleaned up a bit. Had Brad with Dad Pete, buddies Mark,John,Ronnie, and Dave. Started jigging outside the inlet for a bunch of Blues and Stripers to 30 inches, decided to run south and got into more blues off of Seaside, made a further run south and found the Stripers, landed keepers up to 32 inches and blues up to 10lbs. Total tally was 3 keeper Bass to 32 inches and over 40 blues to 10lbs. Fish were still feeding on sandeels, Ava 17-47's were the ticket. Today I had Paul Ramirez and family for a full day trip. Along was his 6 year old son John Paul, his dad and brother. 3 generations on the boat today. We left the dock at 8am and headed to the same area as yesterday. The fish were very scattered and besides seeing alot of bird activity, we only had bluefish hit our jigs. From there we headed south and we had the same results. Alot of boats and scattered fish. After an hour and a half of jigging, my guys wanted to hit the wrecks so we set up on a wreck in 50 feet. The west wind was honking pretty good at that time but that didn't stop the tog from biting their heads off. We sat on that wreck for 3 hours without any letup on the bite. We easily limited out and threw back ALOT of nice keepers. After that we hit another wreck a little offshore to see if we could find a few seabass mixed in. We found a few seabass but again the tog were chewing hard on this wreck too. As we were anchored, the gannets started diving around us so we picked up the anchor and slammed the blues with 2 nice keeper stripers mixed in on the jigs. Like yesterday, the only 2 bass we hooked were both keepers. Awesome day out on the water with some real nice guys. The little guy was a real trooper, fishing and helping out all day. Can't wait till next Sunday! What was supposed to be an all day striper/tog trip turned into a 4 hour jigging quickie. We left the dock at 8 and got back in at 12:30. Roger and his buddies toughed it out in the 20 knot south wind and then heavy rain for 6 or 7 big bluefish and 2 keeper bass. We were fortunate that the only stripers we boated were both keepers. These guys were very good fishermen and alot of fun to hang out with. Can't wait to get them out on a 10 hour!! Had Dave with wife Stephanie and buddy Pete. Started out striper fishing and landed a keeper and tons of blues. Since This crew had caught stripers before they wanted to try togging for the first time. They quickly got the hang of it and got over half a dozen keepers up to 4lbs. Once we had our limit we went back to Striper fishing, slow bite for them in the afternoon, but landed over 20 blues to 10lbs. Had Alex with son Alex Jr, and buddies Gustavo, Stefano, Marcelo. Started out Striper fishing in the morning and had a nice bite with 3 keepers to 33 inches and some throwbacks and bunch of blues. Bite died, so we went tog fishing and under tough wind conditions got our boat limit with a dozen seabass to add to the catch. Ended up the day with more short Stripers and a bunch of blues to 10lbs. Nice part about today's trip we got the guys on their first Stripers and Togs. Windy but fun day with some good guys! Had Mike with buddies Rick, Roger, Mat N, and Mat(Ludacris)L. Started getting jiggy with the Stripers had tons of blues and a couple of shorts then it died with the slack tide. Decided to try some bottom fishing and had a nice bite for the hour we did it. Blackfish to 5 lbs, and lots of seabass to 2 lbs. Got the call the Stripers were on the chew so we went back to jigging and caught over 20 Blues to 10lbs, and over 2 dozen Stripers to 30 inches. Beautiful day with a bunch of great guys! Out fishing for some sea bass and blackfish today with mate John F., didn't have as many togs, but a lot of Seabass with one nice trigger, again in a short amount of time. Seabass where so thick they were eating the whole crabs making it tought to get the togs. Ended up with a dozen togs and over 4 dozen seabass to a 2lbs. Dock to fish in the box 15 minutes. Had Ron with buddies Joe and Mike. Started out in at the tip of the Toms on the troll, Ron landed the biggest mahi of the year close to 20lbs, continued on the troll until dark with no tuna. At night the conditions were right for the drift, again no tuna but had mahi and a mako for the first half of the night. Later we set up for the chunk on the hook and had tons of life under the boat, had our first sword of the year ready to be darted ,but he made one last dash and pulled the hook. Had some more mahi to end the night. At first light we went on the troll and had our shots,but luck wasn't on our side. Had 2 longfin come up but pulled the hook shortly after, then had a huge boil and saw a bigeye come after our spreader bar, on his first run he broke the rig, and he was gone. Ended the day tilefishing with no luck. Tough day but had some great guys on board. Had Ken with son Rich and buddy Nick. Decided to try to hit the Tom's based on the latest sat shots. Arrived at the canyon and was greeted with some sloppy seas. Decided to mahi fish until the seas calmed a bit, landed a bunch of gaffers to start the trip. Went on the troll with no bites, set up for the night chunk again with no bites, decided to Sword/Shark drift, had some runoffs but wasn't sure if they were tuna or swords, wound up battling monster blues sharks all night, with no luck of the desired species. Went back on the chunk at 1-5 am with no luck. Started the troll and with no bites by 8am the crew decided to mahi/tilefish. Landed another dozen gaffers and went tilefishing. Landed our first Blueline Tilefish, rare for the northern canyons. Ken then landed his biggest Golden of his extensive canyon career and our biggest Golden of the year over 30lbs. Total tally 2 dozen gaffer mahi, half a dozen tiles to 30+pounds, lots of big Bluesharks. Today I had a four man charter with Pat Duffy and family. They never fished saltwater before so I asked them if they wanted all day wreck fishing or mix it up with some jigging bluefish. They liked the combo idea so instead of running to the south, we headed right up to the north where the bluefish reports have been much better. On our way up we didnt see or mark any blues so we went right to the bottom action. First drop in 45 feet had some nice life on it and we boxed a bunch of medium size seabass, released some real nice fluke and a lone porgy. From there we hit another drop in 42 feet and that one was hot with some bigger seabass on it. All these larger fish just moved in after that blow last weekend. We got a bunch of keeper doubles on that piece. After 3 hours of wreck they wanted to go look for blues so we headed north about 2 miles and it was game on with all the blues you wanted crashing spearing everywhere! We had a real nice day on the water and got some nice fish. Perfect! I finally got back into the local scene after spending 2 weeks fishing for bluefins at the claw and finding some new wrecks far south for this years blackfish season. Today I had Ed Mcginnis, his son Connor and friends Jack and Frank for a fluke trip. Left the dock at 7 and as soon as we break the inlet the SE swell was rolling pretty good and the wind was blowing a good 15 knts from the south so instead of running far north like I planned to we opted to start at the reef. We hit a bunch of my favorite fluke drops but we couldn't even buy a bite there. At 10, the seas got better so we decided to make the 15 mile run. On the first rockpile we box a nice keeper right away plus alot of small seabass. We had a slow pick of nice size fluke, boxing 12 up to 5 lbs and also 11 keeper seabass. Tough day fishing but alot of fun nonetheless. I think we would of done better if we had a drift. The wind was pushing up against the tide the whole time! Had repeat guys Dan Bombaci, Sam Melendez and John Toronto with crew Capt Keith Mauer and Capt Alan Benerof on the assist. Went back to the claw during the dark to gather some live squid at gray light we had our first bite and lost it. Once we put the squid down it was game on. Landed 2 fish with our biggest of the year of 60 plus inches, around a 140lb's. Once the bite ended we headed back to the barn with our catch. Had Chris out on thursday with buddy John for some Claw Bluefin. Started chunking at 6am, and had bites on the jigs shortly after. Of the 10 bites we had more than half came on jigs. Came tight on four and landed 2 of them to 110lbs. First time tuna for both guys. Baits of choice were sardines and butters off the bottom and 100ft down. Great time with the guys! Had Frank with buddies Sacha, Ken and John. Based off the latest reports the guys booked the trip at the last minute. Left the inlet in the dark to some sporty seas. Never got a chance to get to the Claw to chunk/jig due to the conditions. Decided to troll the last 10 miles, 15 minutes into the troll the deep Iilander/Bally on a planer goes off. 30 minutes later we put the dart into our 120lb Class fish. Seas were getting angrier and 2 off the guys felt the effects so we finished off the day bluefishing on the ridge getting close to a dozen on light tackle. Had John back with buddies Bill and Vinnie, based on the reports decided to head down to the Claw and work the southern canyons. Started trolling at the claw with no luck, since the canyons were slow on the chunk we decided to try the claw based on the amount of bait. No fish on the chunk but did land to brown sharks to 100lbs. The first light bite in the morning started and it was game on, Vinnie got the first bite with a sardine butterfly jig which was 130 lbs, on the Trevala/Torsa combo, then we started getting bites on sardines. BY 9am the the guys had had enough. We ended the day mahi fishing landing 4 to 5lbs. Had Mike Shannon with sons Trevor and Brendan out for their first ever fishing trip. Decided to keep them in the bay and try for weakies. Netted a bunch of live bait and set up the slick. Both of the kids landed their first ever trout to go along with some snapper blues. Today I had Jeff and his friend Alex from NYC for a 6 hour mixed bag charter. We started out on some big bluefish south of the inlet that were bustin the bunker up. Those fish were moving really fast so you got one or two casts on them and that's it. We hooked a bunch of big blues up to 12 pounds and released all but one fish. Around noon we headed NE to a wreck in 70 feet and got a pick of nice seabass with some fluke and tog mixed in. The guys had an awesome time on the water and they winded up taking some of their catch to a local restaurant to have it cooked up in a bunch of different ways. Nice! Had my frat brother Kevin back again this year with Bro Rob, and buddies Dave, Neil, Lee and Henry. Started fishing the reef and set up on some nice pieces, made a couple of moves throughout the day and all the stops had life on them. Ended the day with over 40 Keeper Seabass, over a dozen Blackfish with half being keepers, a dozen Ling and Fluke to 20 inches. Lots of fun and some great catch amounts with a great bunch of guys! Today I had repeat customer Miquel and his boys from NY for a bluefish trip. We ran into some birds off Spring Lake with blues under them but they were moving very fast so we had a few hookups but only boated one fish so we left there and headed to the rocks. There we anchored up in 25 feet but we had wind against tide so we had a few runoffs but no hookups. I decided to put us on the drift because of the crappy anchoring conditions and that's when all hell broke loose. My guys jigged and baited 48 blues plus a lonely seabass with the blues boiling all around the boat. They had a blast fighting those blues on light tackle. As usual, they were awesome to fish with and alot of laughs all day. See you guys next year hopefully on the new boat. Had Tim out yseterday evening with his brother in law Dom and friends and work crew from his business Manuel, Ronnie, Rodrigo and son Danny. Decided to hit some local snags for some constant action for seabass. On the way to the grounds we saw lots of pods of bunker being harassed so we decided to fish it for Stripers/Blues or posssibly Sharks? Tried that for half an hour with no pick ups, proceeded to the spots and set up. First and only spot was drop and reel fishing with the screaming current. Once it died the bite was over. In the short amount of time the guys landed close to 20 keepers and at least that many more throwbacks. Took the day off today from charters to give the boat a little TLC, worked through our punch list by 12pm, so decided to do a couple of hours on the reef. Had Capt Carlos, Capt Joe G., John, Noel, and Rob. In a couple hours of fishing we had a nice pick of Fluke to 22 inches, Blackfish to 15 inches, and seabass to 3lbs. Thanks guys for the help today, great time on the water! Had Greg with buddies Dave and Rob and Larry for a canyon trip today. Got to the South Toms last night in flat clam conditions. Set up for the night sword/shark drift when the winds came, winds blew from the south at twenty knots which blew that way until late afternoon. Played havoc with all of the fishing plans. In the morning trolled with the heavy winds towards the Tip of the Toms vs the Carteret as planned. Had good 80 degree blue water but no tuna, had a Nice Blue Marlin take 2 whacks at a Canyon Runner jet/dressed Ballyhoo before she got away. Landed a small mahi and that was it for the day. Made a run south to the Carteret in a tough head sea but missed the bite that was there, tried making something out of nothing by trying for Bluefin at the Resor but again no hits. Mama said there would be days like this. I had Mike and 3 of his buddies out for the Elks fluke tournament. Shot up north to the rough stuff and couldn't get it going all day. We winded up with 5 keeper fluke and 6 keeper sea bass. Since we knew we had nothing to weigh in, we stayed out and jigged up a bunch of big blues for some action. My guys chose to drag bait for most of the day whereas in the area we fished you have to throw the spro! As always, mike and company were alot of fun to fish with. Tight lines. Had Dr. Matter and Tracy in from Dallas Texas, plan was to jig some blues and hit the reef for seabass, but big ground swell and low sixties water temps, squashed that idea. So after lunch we drifted the river, to my surprise we landed close to twenty fluke with 2 keepers the largest going 23 inches. 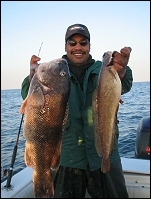 Capt Richie and Capt Joe G ran Mike's crew up north to the rocks for a jigging trip. Once they got there it was lights out fishing, the blues were chasing baby sardines and anchovies and the guys were hooked up right away. Ava jigs on the bottom was the ticket besides over 20 blues to 12lbs released they found a 20Lb Bass to add to the catch. Had Luis his 2 sons and nephews in town with John Cursinella. Decided we would chunk for Bluefish and hope for a stray Bass, only the bluefish cooperated and it was very slow at that, tried a drift for fluke, but no wind or current. Anchored up for seabass and caught over 20 but no keepers. Set up for Bluefish/Bass one more time no bites at all, just short seabass, and sandsharks. Ran south and worked the bunker pods. no fish on them, took one last drift on the reef, wind was honking and drift was over 2 knots, only short seabass. Fishing was dismal, but Luis and his family were great to have on the boat, John C was a fun as usual. Today I had Joe and some friends and family for a day trip. We started out at the reef for some fluke but with a large swell and a 1.5 knot that area produced nothing for us. We then headed north and fished some rough bottom for a few keeper seabass and three keeper fluke. After that we headed south a bit and went jigging for some blues. We had some pretty decent action on some working birds and heavy reading. Blues were large up to 12 pounds. Some of the guys never caught a fish in their lives so the blues were a good introduction to saltwater fishing. The winds never really materialized and we had a nice day out. Saturday I had Chef Ayril, owner of Fleur de Sel restaurant in New York and his lovely wife Brigette and his dad Jean-Michel for a bottom fishing charter. It was a birthday gift for his dad. We started the day at the reef and picked away at some sea bass and ling. Not satisfied with the action we then headed north and anchored up on a rough patch in 40 feet and picked some more. The winds got crankin so we headed into the river and finished the day there with 2 keeper fluke out of maybe a dozen shorts in an hour. Action was ok overall but we still winded up with a decent catch. Beautiful day out with some very nice people. Had show hosts Daniel and Jean Guy, back to shoot another video, with buddy/camera man Peter. After last years Striper shoot I suggested a overnight canyon adventure to shoot, which they agreed would make for good footage. Goals to shoot were tuna on the troll, light tackle mahi and tilefish. Left the dock in the afternoon to take advantage of an evening troll, had 2 shots in the evening, had 2 fish on and with only 2 anglers not including the camera man, made the decision to not continue the troll and have more fish on than we could handle, while clearing the lines tuna were busting all over the Canyon Runner Rainbow Squid Speader bars. Landed one of the 2, 60lbs Tuna. Our next shot came before dark, had tuna busting over and over on the lures but only 1 stayed button, landed it, and set up for the night sword/shark bite, had one run-off on the shark rod which we missed. The next morning went back on the troll and which yielded only mahi, worked the pots for more mahi which held them in the East side of the canyon. The next morning's troll was slow, and since the guys had tuna troll footage, and mahi, they opted to finish the shoot with tiles. Landed half a dozen to meet all of the goals of the charter. Great time with a bunch of good guys from north of the border. Had The Doc out again with wife Barbara and son James for an afternoon meat trip. Started out in the bunker pods outside the inlet with live bunker with no takers. Ran out to the reef and started picking away at nice sized humpbacks and ling, when the wind turned on in a fierce way. Tried anchoring to stay on the fish but conditions wouldn't allow it. Decided to salvage the rest of the trip with some bucktailing for fluke in the river. Had over a dozen with 3 keepers to add to the catch of Ling and over a dozen keeper Seabass. Had regular Mark on board with sons Nick and Daniel. Decided to give the Bonita a try on the Ridge, no deal, water quality was good but water temps mid 60's. Ran back inshore to get some bunker and check the pods, not much activity, set up on a piece for seabass and caught close to 30 with a dozen keepers for the family for dinner. Ran back inshore for some Striped ones, but again they were not around. Saturday morning I had a half day trip with Mr and Mrs Richard Vanata which by the way are my aunt and uncle so it was certainly a no pressure trip. We left the dock at 7am and messed around with some huge bunker schools outside the inlet but there were no signs of any stripers. We then took off to the reef and hit one spot for about an hour and we landed a dozen keeper seabass and 6 ling. After we left there, we headed back into the river to finish out the trip on some light tackle fluke. We had nonstop action with shorts plus one keeper at 19 until the cold water came in and shut it down. It was a pretty good day of fishing but more important I got to spend some time with my family. Till the next time! This afternoon I helped out our friend Capt Richie who's boat is still out of water and we slayed them. All big fish on plugs,jigs and bunker. We limited out the boat with fish up to 35lbs. Great trip. I did back to backs with my first trip being a belated father's day gift for a very close friend of mine's dad. We left at 6am and found stripers blasting bunker outside the inlet. We had our snagger rod spooled after baiting a huge boil on the surface. We then headed south for a few miles and found more bass bustin the surface. A large thresher busted up that school real quick! Awesome sight to see with that big tail. Anyway, we found another pod close and fetched up a nice 32 pounder and headed back to the dock. Today I had Jim and 3 of his buddies out for a striper outing. Left the dock at 7am and snagged a bunch of bunker right outside the inlet. Reports up north weren't that good so I went south and got into a bunch of pods not too far but the blues were really thick in that area. We slammed them for about an hour but no bass. Went further south and drifted a large body of bunker with large stripers mixed in but were down deep. Everything was caught with 8 ounce weights on 3 ways. They went on a small bite for us and we were able to land 3 nice bass up to 40 pounds while dropping a few. The guys were awesome to hang out with and the sea were calm. Nice!! Today I had my friend Mike Roth and a bunch of his buddies for a 6 hour striper trip. We left the dock at noon and got into a pod of bunker just outside. As soon as we started snagging, the fishfinder lit up with schools of bass. Dropped a livie and it was nonstop until we left 3 hours later. The winds were 20 from the SE and half of the guys who never been on a boat before were chumming the waters, so we cut the trip short. Also, a strong storm was approaching from the east. Even so, we boated 6 big bass up to around 30lbs. plus we dropped another half dozen including a real bruiser that almost spooled one of our toriums. Great short trip! Our good friend Capt Ritchie from Michele Ann Charters had a group of his guys on our boat today for a striper trip. His vessel is getting tuned up this week so I did the trip with him. We left the dock and snagged some bunker outside our inlet. We played around some large pods of bait but we only found blues with a lone striper mixed in. I got a call from a buddy who was 7 miles to the north and when we got there it was totally insane fishing!! We limited out on the first drift with all big fish up to 35 pounds. After that we played catch and release, catching stripers on crocodiles and poppers. There were fish busting the surface everywhere I looked. It was amazing to witness that. We ended up with a boat limit of 12 big bass while releasing at least 20 more fish. Some guys had bonus tags. Awesome day out with some good guys. Had the what felt like an Alumni Coaches convention on board today. Had the ex Baseball coaches Tony Picaro and Joe Mahan, Bucky McDonald football, Rich Krasuski soccer, Ed Pascuvich Cross country, and Ted Simonelli "head custodian", (Ted the guys made me say it.) Had a decent pick on seabass with over 20 fish caught, and half a dozen ling, until the dogifsh moved in. Towards the end of the trip we made an attempt at Stripers, but Jumbo Blues of 12lbs would have none of that. Battled close to half a dozen brutes, with no Stripers making it to the box. Great day with an awesome bunch of guys in beautiful conditions. Was able to break Dr Cane away from the operating room today, and have him join me for an afternoon of Striper fishing. Dr Cane was able to land his first Striper of his life also being the biggest fish he ever caught on rod and reel, the fish was over 20lbs. Had Larry out with buddy Ed Whitman. Both of them were Striper live-lining newbies but they represented today. Bunkers schools were thick from the inlet all the way north to the rocks. Found the right pod of fish had our limit on the first drift. When it was all said and done we landed 10 fish to 30lbs on one drift. It was drop and reel fishing I even got in on the action. Had tripleheaders on, so went to 2 rods to keep up with the action. Bass were boiling on baits as we dropped them in the water, dead baits and livies didn't matter they hit everything. Today I had my favorite group of the year for some bottom action!! We started out on a rockpile in 42 feet with not much life on it but short sea bass so we moved on to a wreck in 52 feet and began to pick at some nice seabass and ling. Bottom temps might of been a bit cold because the readings on the scope were huge but we only had a decent bite to show for it. We bounced around to 2 other places and they picked hard at them and by days-end we ended up with 33 ling up to 5 pounds and 31 seabass up to 3 pounds plus alot of shorts. Nice catch with some flats seas to boot and a ton of laughs. Thank so much guys for the great time! Had Terrance out with his buddies today. Capt Alan and John worked their butts off to find the bite, livelining, trolling, jigging, marked the fish but they wouldn't bite. They went to the reef to salvage the day with some keeper seabass and fluke. Had Todd back again with brother Rob who flew in from the midwest, and Buddies Dave"Stumpy", and Guzy. Had them out for an evening and morning trip. Started out seabassing on the first session and had a decent pick of 25 fish to 4lbs, and fluke to 6lbs. Ended the trip livelining stripers with only blues to 12lbs for our effort. Second session was livelining for Stripers and we had a decent pick in foggy conditions, Stumpy landed his first Striper of his life and a nice one to boot 46 inches and fat we figured over 35lbs, and we were right weighed in at Hoffman's right at 35lbs. Landed 2 more nice ones before the bite shut off. Finished the day with more seabass to 4lbs and fluke to 4lbs. Today I had Willie Engelhart and family for a striper mission. Went right to where Capt Fred loaded the boat with bass the night before. We didn't see any bunker on top and we marked nothing. The reports that I was getting were pretty bad so I asked the charter if they wanted to get some sea bass and 5 minutes later we were off. First stop, the kids got it going by boating the largest sea bass of the season. We continued to pick away at sea bass and ling for a while before moving to another snag and doing the same on that piece. Again the kids with the hot hands. We then headed south and drifted livies over some decent marks and trolled bunker spoons without a touch. We finished the day casting to small blues in the river. Once again the stripers are there one second and gone the next. Crazy season. I had alot of fun fishing with this group. I had John Liptock and friends for a striper trip. We headed south of the inlet to the area where we've been catching. After a few drifts with livies and no takers we kept going south. Saw one bass caught off seaside and did a couple drifts over some readings and nothing. Went all the way past Barnegat Inlet and after trolling for an hour without a hit, we headed offshore 3 miles to a wreck which didn't produce much due to the fact that the bottom water temps were at 43 degrees! On the way back, we found a huge school of bunker being blitzed by 15 pound blues. 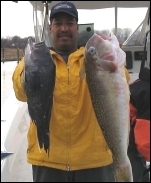 Our mate Joe G. saw 3 large bass next to the boat but the blues were too thick and quicker to the baits. He did almost get spooled by something really big. We're thinking maybe thresher? Well the guys ended up with a ton of big bluefish for the smoker and the day was real nice out there. Had Dr Kudla with son Mark back onboard today, like last year all the stripers came at the tail end of the trip. Started south of the inlet at Seaside, got intel of bait up North in Deal, ran up the beach and found acres upon acres of bait. First couple of pods had no Bass, once we found the right one it was drop and reel fishing. Got our limit on the first drift with fish to the 20+ pound range. The fish were smashing the baits out of the water at boatside, went into release mode and let go a nice cow that was 45 inches, 30+lb's easily. Also, meeting the goal of Mark's dad to have his son catch a Bass greater than half his 10 year old son's length, and larger than his personal best of 15lbs from last year. Mission accomplished! Had my buddy Nilesh with his kids Antra and Part. Had some small cocktails blues in the river but headed out to the ocean for bigger quarry. No Stripers but Antra nailed the biggest fish of her life this 10lb Blue. Great Job Antra!!! Had Jack back again this year with son Sean and Buddy Ed. Started by making bait right outside the inlet, however unlike today vs yesterday I stayed in the area and worked the bait for Stripers. Had a small bite that didn't last long that yielded 2 20lb Bass. 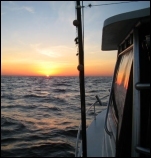 Once the current died we went offshore to load up on some Ling and Seabass. Ended the day chunking only to have some run-offs and Bluefish. Had Jim out again with brother Paul, his ex- high school teacher Wit, and buddies Chris and Rich. Started out making bait right outside the inlet, with live bunkies we went searching for Bass, made the cardinal mistake of leaving the bait after hours of no bites ran way north and missed the bite that happened in the are I was. No luck up north so we decided to save the day with some blues and bottomfishing got blues to 6lbs, keeper seabass, and decent size ling. Came back to were we left the bite and bait was still there but no Bass. Had Mark back again this year with buddies John, Rob, both Mikes and newcomer and fishing rookie Graham. Went to the North and set up on the drift, wind against current made for too much mess, set up on the hook and only blues to 10lbs. Trolled some nice keepers and ended up drifting another one on the drift. Ended the day with 3 Bass to low twenties and more blues to 10lbs. Had Graham catch his first fish of his life which was cool to see. Based on the last good Ocean Striped Bass catch with Captain Carlos and the reports of good bassing to the south, we headed down a week earlier to take advantage of the run. Had frank out with son Tory and buddies Frank and Matt. Started looking for marks south of the inlet and found them but they didn't chew. Went seabassing to put Tory on his first seabass, got a baker's dozen then resumed our search, found them and had 5 fish on at one time. Tory our young stud in training nailed the pool winner by hooking it himself, then fighting it, then handing off the rod and netting it himself, all at 7 years old. Nice thing about today's catch not one bluefish in beautiful calm waters. I had the Dave Zeigler charter for an afternoon seabass/striper trip. We started out on a wreck in tight to the beach at 35 ft. It was loaded with nice seabass and large ling to around 4lbs. They also caught and released carefully alot of female blacks up to 5lbs. This was the groups first time wreckfishing and they were amazed at the variety of fish that live on a wreck. Had Shawn back again with Matt, Barry And Sean. Started drifting only blues, set up on the chunk more blues, at my last spot I started reading some good marks and set up on the drift with wind against tide conditions. Matt who had never landed a Striper got us started and popped his Cherry. The rest of the guys got with the program and we nearly limited on one drift, before running out of bait. Fish wanted heads on the bottom. Nice thing is the Stripers bit aggressively for the first time this year. Had John back on board with buddies KC, Mark, Bob, Tim, and Anthony. Started out drifting for Stripers just blues, went on the chunk more blues. Later in the evening we good into a decent bite and missed some runoffs and lost a couple of fish near the boat, finally landing our only keeper. Had John back again this year with Dad Jim, and buddies Vic, Gary and Bob. Netted bait in GK one throw, more than enough bait. Then drifted the grounds, had a slow pick of 3 nice keepers to mid twenties size, with some fish lost at boatside and plenty of runoffs. Went on the chunk and landed 40 blues in a row and decided to back on the drift, landed many more blues but no Stripers. Tough day fishing but good bunch of guys to have on board. Had Charles with Buddy Larry Brusskin fly in from Miami for some Stripers. This year he added a new twist he wanted to plug a Striper with his brand New Shimano Curado with 3 piece travel rod. Ran out of the Harbor and read a ton of fish in Keyport stopped and let him and Larry surface plug over 20 blues to start the trip. Ran to GK and netted some bunker and let him plug some more and landed many gators to 12lbs but no Stripers, did some live-lining and he landed a Bass over 20 lbs. However his goal was a keeper on the plug, ran to some local rock piles and he landed a 32 inch beauty on the plug to accomplish the mission. Great fishing with a bunch of good guys. Today I had John Lax and friends for a 6 hour trip. They wanted a shot at some stripers so we loaded the livewell with bunker and grabbed some clams and we tried both to no avail. Our buddy who runs a clam boat even let me in his slick but not a thing. We had a bunch of runoffs that came back clean but other than a boatload of bluefish, no bass. At 11, I asked the customers if they wanted to try some other kind of bass(seabass), and they asked if they were any good to eat. Once I gave them the answer we headed SE 9 miles to a wreck in 50 ft and in an hour we boated 2 dozen seabass up to 4 pounds and threw back at least 20 nice blacks up to 5 lbs. Nice day on the water and they were alot of fun to fish with. Fished the prestigious ASA Striper tournament with my sons Antonio and Danny, and Andreas Toy Crew Mike Tyas and Jerry Tomaselli. Netted the bunker and headed to the weigh in. Checked out and headed to my first spot, had fish on within minutes, landed 3 fish on the first drift. With windy conditions my youngest fell prey to "Mal De Mar", ran up the Hudson to find a cow. No luck, went back to the bay and landed non-stop blues to 15lbs. Ran to the weigh in and saw our fish was in first place all the way to the awards ceremony. Our 27lb fish won the Calcutta for the biggest fish of the tourney. Thanks to my sons and teamates for a great day on the water. Had Chuck with buddies, Bob, Elia, Randy, James, and Kevin. Got our bait at GK and started the drift, Bass bit on heads on the bottom, lost some fish intially, but once the guys got the hang of it Bass started to come over the rails. Landed 3 fish to 20lbs. with many blues as usual. Had Andy with brother Joe and Dad Joe Sr. Started out live-lining, blues were too thick, made a run out to Romer and had a mad-dog bite, landed 4 keepers, premature released some more keepers, and released a bunch of shorts. Once the bite died we went back to live bunkers and got covered up by more Blues, close to 30 of the demons in all. Never seen so many. Had Brandon with brother Nick, buddies Sacha, Frank and Ken. Netted our bunker, and had Bass to 20 lbs right way, blues took over and never let up. Went to plan B and started clamming, had our limit within in an hour and released another dozen shorts. ended up doing some more bunker fishing to end the day. As usual had over 50 blues to 12lbs to round out the catch. Had UCONN starting left guard Alex Lamagdelaine onboard today. Working around his workout schedule and seeing his family for his short stay before Spring Ball we took a late morning trip out. Hard getting the bunker in GK we made bait and took some short drifts and Alex popped a nice keeper, after that it was down hill went through 40 blues to get this keeper. Good Luck this year in the Big East Alex. Got out for a couple of hours with family members Gustavo and Pepe and friends Mat and Mike. Had to be back in time to fire of the grill for lunch for wife's day. Went to GK to load up on bait and my first 2 drops were loaded with bluefish. Last and final drop had Bass and we caught them until we ran out of bait. Luckily we did would have wound up running late for lunch and would have been in the doghouse. Got out early and got the bait before it got to crowded.. the crew i had out today was a great group of guys and had entered the nj hunters/fishermen tourney... started out on the chunk and put two bass in the boat right away ..picked through the blues and missed a good amount of bass... bite slowed so moved east first drift 2 more and couldnt put anymore in the boat for the rest of the day.. def missed another few bass hooked up and then just lettin go an coming back scaled.. also had prob around a 30 break an 8/0 gami 15 feet from the boat ..bummer... ended with the four bass and missed winning the tourney by 4 oz ... ahh oh well next time. I had Sam Melendez and a bunch of his friends from Pa out for the day. We had constant action with the bluefish with the guys taking home around 30 or 40 fish home and releasing another huge load. We had a few bass runoffs and marked alot of fish on the bottom today but the bunker had no chance with all the bluefish around. Anyway, the guys had a blast and all were complaining about sore arms so it turned out ok.
Had Chris back with twin brother Brian, Dad Bob, with Steve and John. Good news Striper bite is getting better, not so good news were that we only landed 3 to 18lbs. Fish were hard to hook lightly hitting the baits, still had great readings but not turned on yet. Also the pesky blues didn't make it easy, had over 50 of the rats up to 10lbs. Had Frank with Kevin, Sasha, and Newbie to fishing Ken. Went to GK to make bait no problem, had blues to deal with, then outgoing tide vs southeast wind at 15+ knots, decided to drift until I got good marks, read lots of marks but only set up once we had Bass on. No luck until uncle Kevin decided to give props "Deadliest catch style", and bite the head off a bunker, a few minutes later he landed the only keeper Striper of the trip. As for the past few trips on the Toy, over 60 blues to 12lbs, but only one keeper. Had the Isola family out today with son William, Dad Jim, and Uncle Ed. Made the run to Great Kills to load up the livewell in one throw. 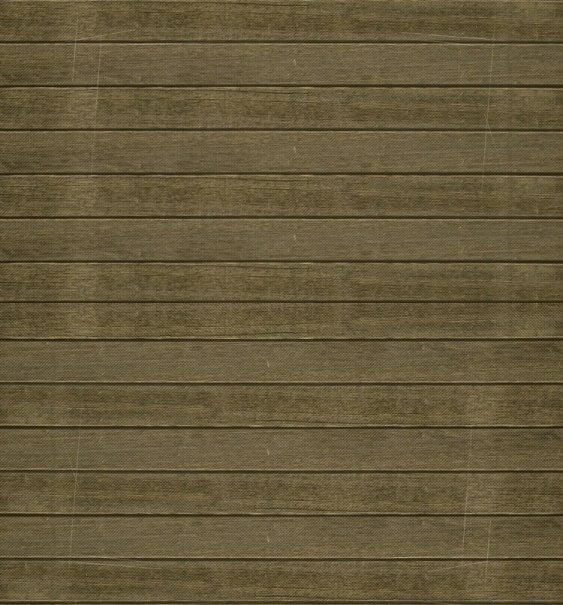 Set up on some great Striper marks, but blues wouldn't have any of that. Landed over 50 fish before they guys cried uncle, as did I, the blues this year are thicker than ever, but nonetheless plenty of action on a calm bay. Today I had Bill Youngblood and family from Bernards Twsp. out for a shot at some stripers. Went across and got our fill of bunker pretty quick. Marked a bunch of fish when I was heading over so I came back and they were still there. All blues! They were definately bass in a wide area that we fished . Had a bunch of good runoffs with the baits coming back clean and the bass readings on the bottom were pretty thick but the amount of bluefish around right now is incredible with 3 to 5 hookups at the same time being the norm! Shot out towards Romer and clammed for an hour without a sniff so we came back in and tried using just clams but the blues gobbled those up just as quick. Total tally for the trip: 50+blues and 1 short striper. Everyone had a great time and the kids had a ball pulling on those big racers. Had Rick out with buddies Gonzo,Ted,Rob, and Booker. Had half a dozen bluefish to 10lbs, and a couple of Bass runoffs that we couldn't convert. Had a good time with a bunch of great guys. After 2 years of preparation, scheduling and luck we were able to finally put together a Tile fish inshore bottom fishing TV show together. Captains Andy LoCascio and Rich Tenreiro joined me today with their camera team, and I was assisted by Capt Joe D, and Jim Mulvey. Started our run out to the Hudson in less than stellar conditions, once we arrived and dropped lines we had fish on right away. Unfortunately the winds were to high to shoot the show, so everyone started fishing until the winds laid down. It was drop and reel fishing with everyone in the crew including Capt LoCascio catching their first tilefish. One the winds laid down the show started, the fish kept biting and at one point in the show all three of us had a tripleheader on. Once we shot enough for the show and tallied our fish we decided to make a run home with a brief stop to top out the coolers with some Cod and Ling. Once we arrived to the wreck it was drop and reel fishing. Total tally for the trip was close to 40 tilefish to 15lbs, 2 dozen Ling to 5lbs, and Cod to 10lbs. want to thanks Capt Andy, and Rich, his camera team, Capt Joe D. and Jim Mulvey for making this shoot happen. More pics to follow, camera went on haywire. Had Mark Jankowski, Dave, My dad and his buddy Olge today. Ran back down south and hit a wreck in 50ft of water over 20 shorts with only a few keepers. Hit another piece a bit deeper and had drop and reel fishing, limited the boat and crews limit in an hour with fish to 5lbs. Left them biting, best bite of the year. Will continue to run down south until the bite stops. Carlos has some spots for this weekend's open trip. Today I had Steve, his dad and brother, and a few of his buddies for some togging. A few of them work on a party boat out of morgan. I decided to head south and hit some wrecks off Barnegat in 60-80 feet of water. First wreck had a ton of life on it and we did pretty good there . They weren't chewing real hard so you really had to work at it. I had one newbie to blackfishing on the boat today and he did alot of cussing on his missed bites. We hit 3 other wrecks during the day and caught fish on every spot. I had a pretty good south swell on the way down and I think that might of affected the bite today. All in all, we boated 20 keepers up to 7 pounds and threw back countless shorts. Everyone had a great time on a nice day out.